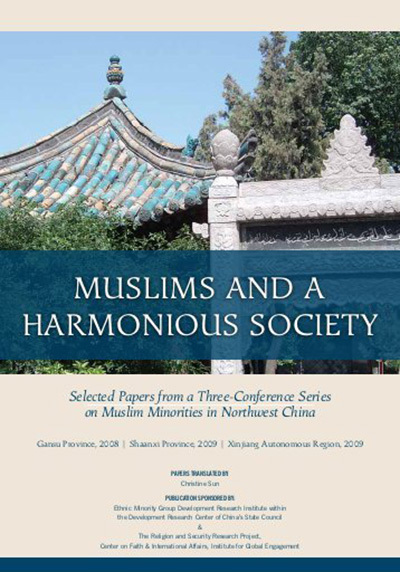 Muslims and a Harmonious Society is a collection of selected papers from a three-part conference series carried out from 2008-2009 by the Ethnic Minority Development Research Institute of the Development Research Center of China's State Council (EMGDRI). The series examined Muslim life in western China, focusing on Gansu Province, Shaanxi Province, and Xinjiang Autonomous Region. This compendium features English translations of conference papers written by a broad range of national- and local-level Chinese experts on various issues related to social development in Muslim communities. Each paper speaks frankly and practically on issues related to faith, culture, development, the rule of law, and stability. This publication is cosponsored by EMGDRI and the Institute for Global Engagement (IGE). The monograph can be downloaded here in PDF format. This publication testifies to the opportunities for peaceful coexistence and fruitful collaboration that open up to those who wish to cultivate and support our commonn global civilization.